Diabetes mellitus or simply, diabetes, is a group of diseases characterized by high blood glucose levels that result from defects in the body's ability to produce and/or use insulin. Diabetes affects the body's ability to use blood sugar for energy. 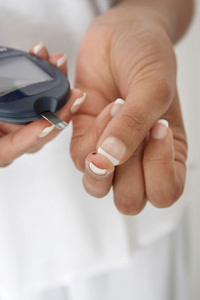 The main types include type 1 diabetes, type 2 diabetes and gestational diabetes. Diabetes insipidus, a rare disorder, is not related to diabetes mellitus (sugar diabetes). 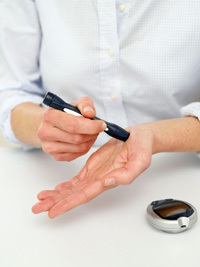 Diabetes symptoms may include increased thirst and urination, blurred vision, and fatigue. Type 1 diabetes is usually diagnosed in children and young adults, and was previously known as juvenile diabetes. In type 1 diabetes, the body does not produce insulin. Insulin is a hormone that is needed to convert sugar (glucose), starches and other food into energy needed for daily life. Only 5% of people with diabetes have this form of the disease. With the help of insulin therapy and other treatments, even young children with type 1 diabetes can learn to manage their condition and live long, healthy, happy lives. Dehydration. The buildup of sugar in the blood can cause an increase in urination. When the kidneys lose the glucose through the urine, a large amount of water is also lost, causing dehydration. Diabetic Coma (Hyperosmolar nonketotic diabetic coma) . When a person with type 2 diabetes becomes severely dehydrated and is not able to drink enough fluids to make up for the fluid losses, they may develop this life-threatening complication. Damage to the body. Over time, the high glucose levels in the blood may damage the nerves and small blood vessels of the eyes, kidneys, and heart and predispose a person to atherosclerosis (hardening) of the large arteries that can cause heart attack and stroke. Anyone can get type 2 diabetes. However, those at highest risk for the disease are those who are obese or overweight, women who have had gestational diabetes, people with family members who have type 2 diabetes and people who have metabolic syndrome (a cluster of problems that include high cholesterol, high triglycerides, low good 'HDL' cholesterol and a high bad 'LDL' cholesterol, and high blood pressure. In addition, older people are more susceptible to developing the disease since aging makes the body less tolerant of sugars. In addition, people who smoke, have inactive lifestyles, or have certain dietary patterns have an increased risk of developing type 2 diabetes. Gestational diabetes is a condition characterized by high blood sugar (glucose) levels that is first recognized during pregnancy. The condition occurs in approximately 4% of all pregnancies. Almost all women have some degree of impaired glucose intolerance as a result of hormonal changes that occur during pregnancy. That means that their blood sugar may be higher than normal, but not high enough to have diabetes. During the later part of pregnancy (the third trimester), these hormonal changes place pregnant woman at risk for gestational diabetes. During pregnancy, increased levels of certain hormones made in the placenta (the organ that connects the baby by the umbilical cord to the uterus) help shift nutrients from the mother to the developing fetus. Other hormones are produced by the placenta to help prevent the mother from developing low blood sugar. They work by stopping the actions of insulin. Over the course of the pregnancy, these hormones lead to progressive impaired glucose intolerance (higher blood sugar levels). To try to decrease blood sugar levels, the body makes more insulin to get glucose into cells to be used for energy. Usually the mother's pancreas is able to produce more insulin (about three times the normal amount) to overcome the effect of the pregnancy hormones on blood sugar levels. If, however, the pancreas cannot produce enough insulin to overcome the effect of the increased hormones during pregnancy, blood sugar levels will rise, resulting in gestational diabetes. Diabetes can affect the developing baby throughout the pregnancy. In early pregnancy, a mother's diabetes can result in birth defects and an increased rate of miscarriage. Many of the birth defects that occur affect major organs such as the brain and heart. During the second and third trimester, a mother's diabetes can lead to over-nutrition and excess growth of the baby. Having a large baby increases risks during labor and delivery. For example, large babies often require caesarean deliveries and if he or she is delivered vaginally, they are at increased risk for trauma to their shoulder. In addition, when fetal over-nutrition occurs and hyperinsulinemia results, the baby's blood sugar can drop very low after birth, since it won't be receiving the high blood sugar from the mother. However, with proper treatment, you can deliver a healthy baby despite having diabetes. Being a member of a high risk ethnic group (Hispanic, Black, Native American, or Asian). Having sugar in your urine. Impaired glucose tolerance or impaired fasting glucose (blood sugar levels are high, but not high enough to be diabetes). Previously giving birth to a baby over 9 pounds. Having too much amniotic fluid (a condition called polyhydramnios). Remember, many women who develop gestational diabetes have no known risk factors.